Citation Information: J Clin Invest. 2016;126(7):2575-2587. https://doi.org/10.1172/JCI85830. Primary congenital glaucoma (PCG) is a devastating eye disease and an important cause of childhood blindness worldwide. In PCG, defects in the anterior chamber aqueous humor outflow structures of the eye result in elevated intraocular pressure (IOP); however, the genes and molecular mechanisms involved in the etiology of these defects have not been fully characterized. Previously, we observed PCG-like phenotypes in transgenic mice that lack functional angiopoietin-TEK signaling. Herein, we identified rare TEK variants in 10 of 189 unrelated PCG families and demonstrated that each mutation results in haploinsufficiency due to protein loss of function. Multiple cellular mechanisms were responsible for the loss of protein function resulting from individual TEK variants, including an absence of normal protein production, protein aggregate formation, enhanced proteasomal degradation, altered subcellular localization, and reduced responsiveness to ligand stimulation. Further, in mice, hemizygosity for Tek led to the formation of severely hypomorphic Schlemm’s canal and trabecular meshwork, as well as elevated IOP, demonstrating that anterior chamber vascular development is sensitive to Tek gene dosage and the resulting decrease in angiopoietin-TEK signaling. Collectively, these results identify TEK mutations in patients with PCG that likely underlie disease and are transmitted in an autosomal dominant pattern with variable expressivity. Pedigree structures and TEK mutations identified in 10 families. (A) Pedigrees of the 10 families with TEK mutations. Specific mutations in TEK are listed below the different pedigrees, with those family members annotated as +/M. Affected individuals are indicated by solid black/gray symbols (black for early-onset disease and gray for late-onset disease; see Table 1 for details). Note: White symbols do not exclude an undiagnosed late-onset disease. Unknown genotypes are marked as ?/?. (B) In family 2, a TEK SNP was inconsistent with father-to-son transmission (upper panel). 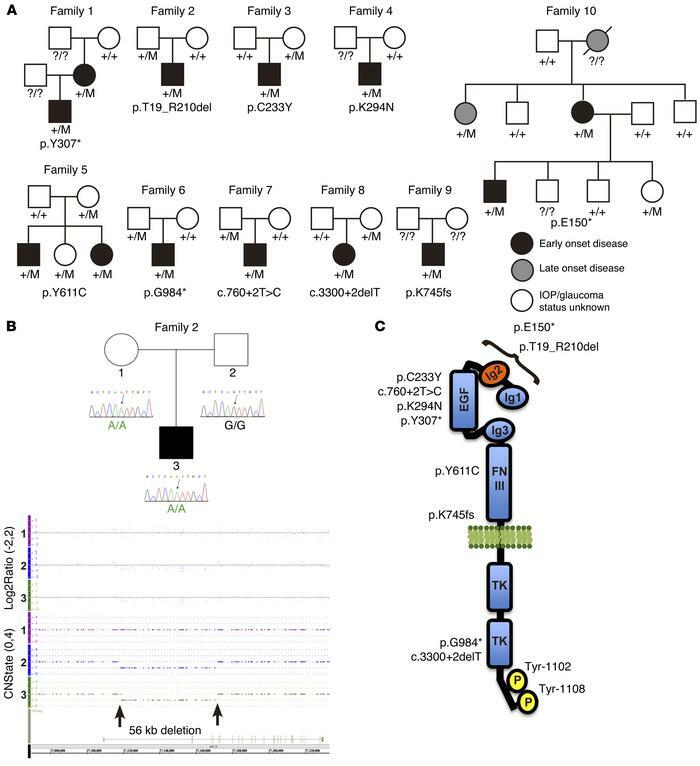 Copy number variation analysis identified a 56-kb deletion that was passed from the unaffected father (annotated as 2; lower panel) to the unilaterally affected son (annotated as 3). The physical location of the TEK gene is shown, with arrows indicating the deletion breakpoints within introns 1 and 4. CN, copy number. (C) A schematic illustration of the TEK receptor with the locations of identified variants. Eight of 10 variants were identified in the ectodomain of the receptor. Tyr1102/Tyr1108 are the primary tyrosine phosphorylation sites in the C-terminal tail of the TEK receptor that initiate downstream signaling events (35, 36).